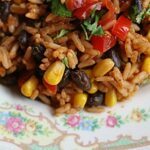 Dress up your favorite Spanish rice by mixing in corn and black beans. Enhance the flavor with fresh cilantro and garnish with some fresh tomatoes for a delicious side. Prepare Spanish rice as box directs. While rice is cooking, drain the corn and drain and rinse the beans. When rice is done and still hot, stir in the corn and black beans. Add cilantro and ross. Serve! Garnish with additional cilantro and chopped tomato if desired. This recipe for Spanish Rice with Black Beans & Corn was printed from AmandasCookin.com - https://amandascookin.com/spanish-rice-black-beans-corn/ and can only be printed for education or personal use.